in Bodrum Turkey, Marine Surveyor and Consultant, RYA & I.I.M.S MCA compliance examiner & RYA Inspector. RYA, I.I.M.S and YDSA Tonnage Measurer. Ultrasonic Inspections on steel and alluminium. Who is Joe Rowles ? Joe Rowles is an internationally accredited marine surveyor based in Turkey and operating throughout the Eastern Mediterranean. Joe carries out all types of marine surveys and is authorised to carry out MCA (Maritime and Coastguard agency) coding for UK registered Small Commercial Vessels. Joe is recognised by the following Certifying Authorities for the MCA: IIMS (International Institute of Marine Surveyors), YDSA (Yacht Brokers, Designers & Surveyors Association) , MECAL Ltd and the RYA (Royal Yachting Association). Acting as project manager Joe offers consultancy and technical advice on new construction and yacht refit projects. Joe has operational experience on various types of marine vessels, construction methods, materials and firsthand experience of boat yards and repair facilities within the Eastern Mediterranean. Joe can help you select the yard and present development reports on a regular basis for refit or new build projects. Joe Rowles has full professional indemnity insurance underwritten at Lloyds of London. Joe comes from a practical engineering background, in the early 1990’s he worked as a Helicopter technician, then transferred to the marine industry in 1993. Since then he has been working on and around yachts both sail and power. After working as a marine mechanic and carrying out refit and repair work Joe started Marine Surveying in 2001. Joe formalised his surveying by attaining a diploma in Yacht and Small Craft Surveying where he specialised in the surveying of rigs, engines and machinery and systems. Joe continues to work as a full time independent Marine Surveyor. Also a keen sailor Joe has sailed throughout the Mediterranean across the Atlantic in the Baltic, North Sea and of course the Solent. Over the years numerous yachts have been surveyed, both powered and sail. 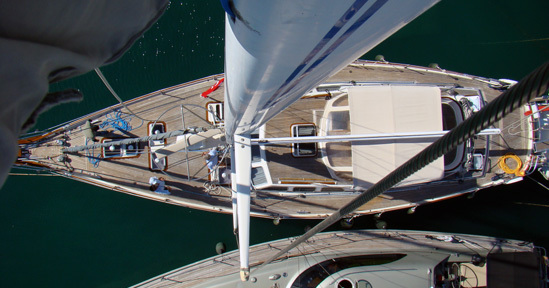 Wooden yachts have been surveyed with various construction methods including: Traditional construction (carvel) with sawn, laminated and steel frames. Strip plank, Ceder strip and plywood. Numerous custom made steel and Aluminum yachts. Contents of this web site and all original works are copyright © 2010 Joe Rowles - Marine Surveyor- All rights reserved. The material on this site may not be reproduced, distributed, transmitted or otherwise used, except with the prior written permission of owner.